The musical journey of my life over the past 40 years has taken me down many paths and led me to many meetings and collaborations with remarkable musicians and composers. Homage – The Silence Inside is the latest chapter on that journey. Thomas Rückoldt is a composer of such sensitive musicality, it became imperative for me to explore the ideas his music inspired in me. He initially made himself and his work known to me via a re-mix project set up by Mushroom Magazine in 2007 of one of my songs, DITTANY. His unique approach and original musical depths made a great impression on me. Eventually, time and circumstances led us to the moment where, over the past year, we could evolve and develop this new project. From hotel room recordings in Leipzig, home recordings in Jena and finally mastering in the studio near Antwerp. We are delighted to present this musical and literary result. One night as I lay down to sleep five years ago, out of the blue, from nowhere, I developed constant, unremitting Pulsatile Tinnitus. It has diminished my ability to write, to perform live. It has diminished me. There has not been one moment’s silence inside me since. However – I have found a kind of deeper, abstract and profound place of stillness. An “essentialness” in every moment, every observance. Nothing is taken for granted or goes unnoticed. Nature, my garden, the birds in and around it, my dogs and a discovery and re-discovery of poetry and words. The writings of the poets I have chosen here. Writers whose works I wish to pay homage to. Who have made the noise inside bearable for me. We hope that this album will take you on a journey too. Or at least accompany you part of the way. To a deeper place. To the silence inside. 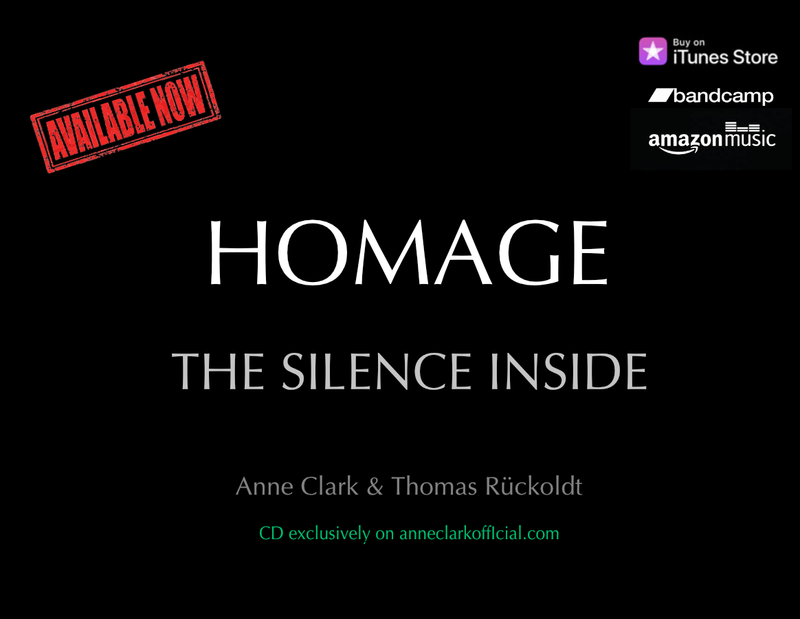 Listen to the snippets of all 15 tracks on the new album: HOMAGE – THE SILENCE INSIDE – Anne Clark & Thomas Rückoldt! 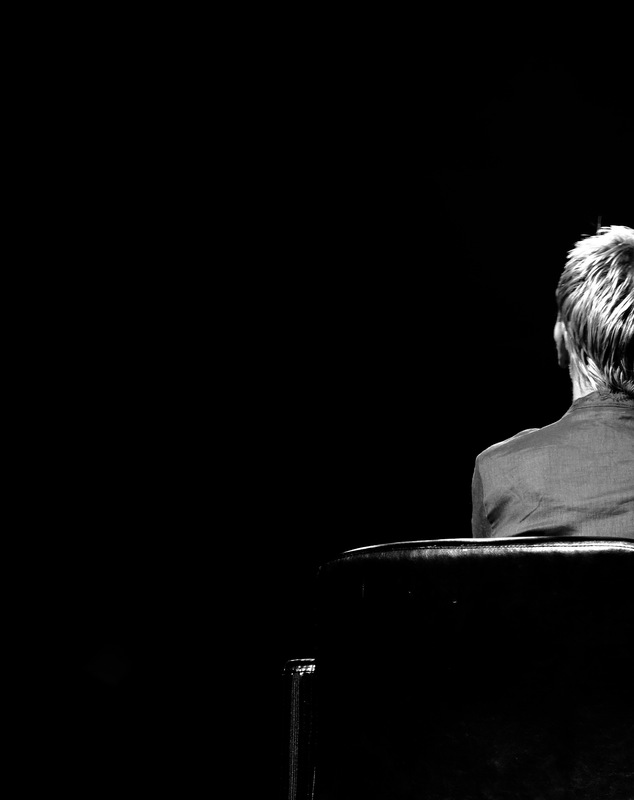 Combining literary, socially engaged texts with innovative and genre-breaking soundscapes, for nearly 40 years Anne Clark has held a unique place in both literature and music. Throughout she has maintained her own identity on each and every recording, from the samples (before sampling became a concept) and electronically treated acoustics of the mini-album The Sitting Room (1982), via ground-breaking analogue synth classics, Sleeper In Metropolis (1983) and Our Darkness (1984) with composer David Harrow, to the extremes of the minimal Scandinavian jazz influences of Until Life (1991) and The Law Is An Anagram Of Wealth (1993), the pastoral and poetic interpretations and translations of Rainer Maria Rilke’s poetry on Just After Sunset (1997) to the full-on electronics and sparse acoustics of The Smallest Acts Of Kindness (2008). Very few artists have covered such a wide spectrum over such a long and consistent career. Always looking for new ways of expression and communication through the emotion of music’s abstraction and use of direct language, Anne seeks to not only challenge herself but her audience also.